What’s the Better Long-Range System? Mil-Dot or Minute of Angle? At risk of re-kindling an all-new “tastes great” or “less filling” debate, we’re going explore both the milliradian and minute of angle systems for ballistic adjustment and ranging targets. Which one is better? Will choosing the wrong system for your rifle and optic combination get you killed? Will Rosie O’Donnell approve of your choice? This scope uses minutes of angle turret adjustments. Each click is ¼ MOA or ¼-inch at 100 yards. Like psychic hotline call results, the answer is whatever you want it to be. Like most things in the shooting world, the answer is not nearly as binary as online forum comments would lead you to believe. Neither system is right or wrong, yet there are pros and cons to each choice. Let’s take a look at some of them. Did you get a D in your first Algebra class? Or maybe you’re one who still won’t be convinced that all that math you learned in school has no “real-world” applicability. Whatever the case, the minute of angle system is simple as far as the numbers go. A minute of angle (we’ll abbreviate to MOA from here on our because electronic words are expensive) is an angular measurement that translates to 1.047 inches at 100 yards. In non-math terminology, think of a super narrow ice cream cone with its point at the shooting line and the ice cream-filling end at the 100-yard mark. That hole would be just over an inch wide. Technically speaking, the MOA reflects the angle of the cone sides and not the mouth diameter, but we’re getting nitty gritty. Even though the elevation grid is organized in full minute of angle increments, it’s still more granular than a mil-dot reticle with half-mil graduations. So, 1.047 inches is not all that simple, but as most users round to “an inch at 100 yards” we’re all good. That “one inch per hundred yards” math, while not precise, is admittedly simple to use. Since MOAs (and milliradians) are angular measurements, their values at different distances are proportional. At 200 yards or double the distance, we’re talking two inches per MOA. At 500 yards, it’s five inches per MOA. Make sense? If you go with the rounding method to one inch instead of 1.047, you’ll get a little bit of error with longer-range calculations. For example, at 1,000 yards, we lose about four theoretical inches of precision if we round down to one inch per MOA. The other benefit to the MOA system is precision per click. Most rifle optics adjust in 1/4 MOA increments per windage and elevation turret click. That translates to one-quarter of an inch at 100 yards or 2.5 inches at 1,000 yards. For that 2.5 inch adjustment at 1,000 yards to be meaningful, you’ll have to have one seriously accurate rifle, so the granularity of the adjustment per click is probably more than you can take advantage of. If a gun shoots one-half MOA groups, then at 1,000 yards, bullets are going to land in a five-inch pattern anyway just from the variance in the rifle, so a 2.5-inch click adjustment may not be all that meaningful. The “impact in inches” is not as easy to remember with the milliradian (mil) system. At 1,000 yards, a mil translates to one yard, or 36 inches. If you use the metric system, things are a bit simpler because at 1,000 meters, a mil translates to one meter, or 100 centimeters. At 100 yards, a mil translates to 3.6 inches. Since mils are also an angular measurement, they operate proportionately like MOAs. It just takes a calculator to work out the math as there isn’t really a “close enough” approximation to 3.6 inches per hundred. So, at 600 yards, your mil to inches translation works out to 6 * 3.6, or 21.6 inches. This mil turret adjusts in .1 mi per click increments, so each click moves the point of impact .36 inches at 100 yards. Since each mil unit reflects a larger value, 3.6 inches per hundred versus 1.047 for the MOA system, you might consider it less precise at rifle shooting distances. That’s not necessarily true because while MOA scopes generally allow four clicks per MOA (1/4 MOA each), the mil system normally assigns a click value of .1 mils. So, between each whole mil measurement, you have ten available adjustment clicks. If you do the per click math and translate to inches at 100 yards, each click gets you .36-inches, or just over one-third of an inch. 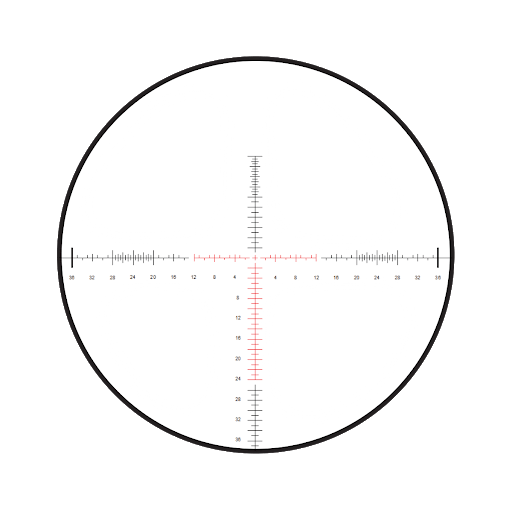 A traditional mil-dot reticle pattern is fairly coarse, with each dot separated by a full milliradian. 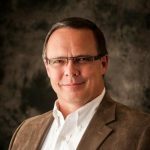 That .36 inches per click adjustment sounds less precise than the .25 inches per click MOA adjustment capability, but does it really matter? Let’s do the math and see. 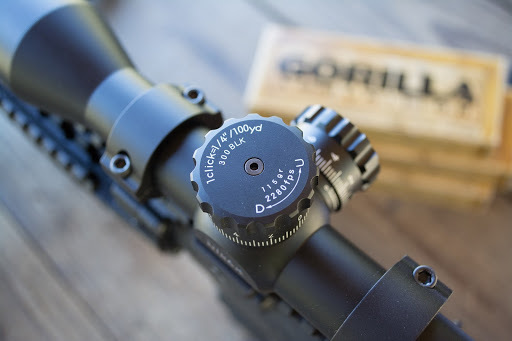 At 1,000 yards, each click on a mil scope will get you 3.6 inches of adjustment on target as compared to 2.5 inches per click with an MOA-based optics. For the same reason outlined above, this probably isn’t all that significant at longer ranges as the group size variability along will exceed that number, not to mention wind call variance. 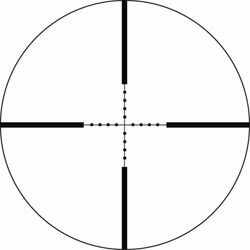 The Desert Tech AMR reticle offers extremely fine graduations on the windage scale with .2 mil hashmarks. 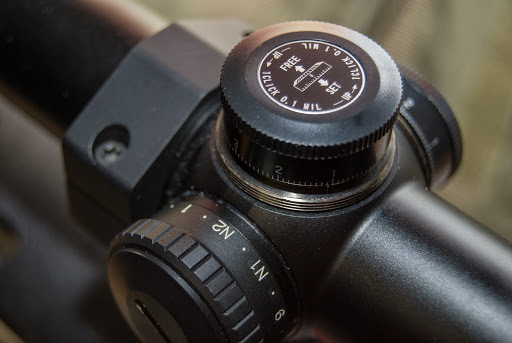 One area where you might see a personal preference difference is in the reticle itself when shooting using elevation hold-overs or windage reticle marks for wind adjustment or lead on a moving target. 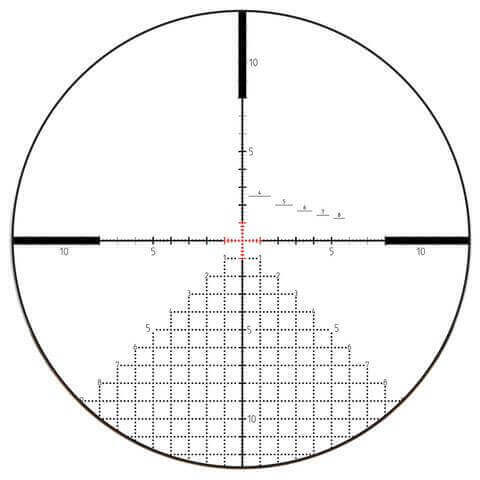 Traditional mil-dot reticles have full-mil spacing between marks on the reticle itself. While more modern designs often include hash marks every half mil, you’ll still likely to get more granularity with an MOA-based reticle. At 1,000 yards, a half-MOA mark represents five inches while a half-mil hash mark represents 18 inches. So, do you want granularity or a less busy reticle?